The Interbank spread analysis revealed that the current situation has not occurred in 17 years, i.e. where a cut in base rates at a interest rate juncture has actually resulted in a widening in the interbank / base rate spread to a new extreme high. Usually interbank spreads are at the widest at the mid-point of a rate raising cycle. Whereas during the start of a rate cutting cycle interbank rates tend to trade at a discount to the base rate. However, the fact that the interbank rate has FAILED to react to the base rate cut implies that the credit crunch liquidity squeeze is deepening, which implies that the impact of the interest rate cuts is far less than had the money markets reacted in line with previous actions. This greatly increases the probability that the Bank of England will make far deeper cuts in interest rates during 2008 as the real rate of interest being borne by the economy is somewhere in between the base rate and the interbank rate i.e. as of last weeks cut we can estimate that the impact rate of interest rate is at 6.07%. Which is still above the estimated impact rate of interest rate in July 07 following the rate rise to 5.75%, estimated at 5.88%. 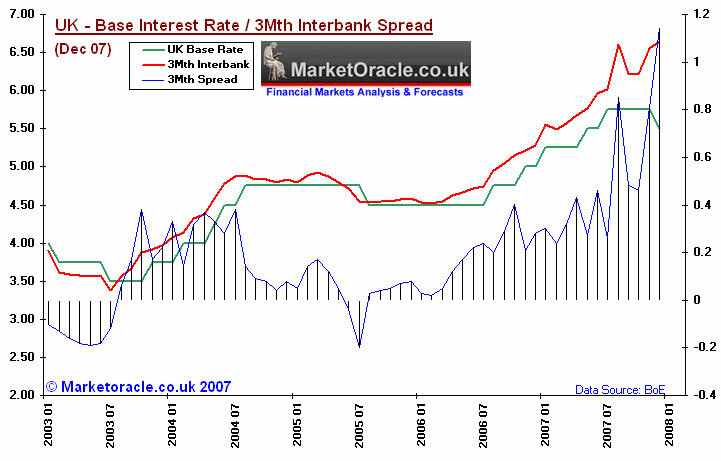 If in a worse case scenario, the freeze in the interbank money markets remains during 2008, then even a deep cut in UK base rates to 4.50% would still barely result in a real impact interest rate to the economy of much different than 5.50%. Unfortunately both the UK and US housing bear markets will persist during 2008 and it is highly unlikely the credit markets will be able to unfreeze whilst illiquid debt is still trying to be valued against falling asset prices. This increases the risks of further Northern Rocks out there teetering on the brink of credit crunch oblivion the consequences of which will only further tighten lending between financial institutions and to the general public as well as impact on the coporate sector that will result with an increase in profit warnings during the 1st quarter of 2008.